Mass transit has a role to play in response to the growing consensus that mankind and its growing urban conglomerations must change course to prevent costly climate disruptions. The chant is: BAU (business as usual) is dead. APTA’s Vision 2050 projects a compelling vision for an efficient, multi-modal future. An on-line video inspires, but offers little in the way of numbers for costs, benefits and, most importantly, the overall impact on mode split. There is no plan, only the plea for public funds and empowerment. Why no numbers? And why isn’t “mode split” mentioned in ATRA’s propaganda? The current 2.5% transit share in US cities is pretty anemic. Even tripling it will get us only to 7.5% -- a good bit more like European cities with their historic pedestrian cores..
Based in Europe, UITP -- the international version of APTA -- several years ago embraced a “bold” goal of doubling transit ridership by 2025. With new metros opening around the world, doubling is far too timid a goal in the context of reducing greenhouse gases (GHG). Vision 2050 has no list of New Starts of BRT, LRT. Streetcars, rapid transit and commuter system. Nor is there talk of the significant benefits possible with a program of metro retros -- upgrading ‘classic’ rapid transit to driverless). Nor is there imagination for innovative modal projects -- despite Miami’s MetroMover success. Podcars are not pictured anywhere. Neither APTA nor FTA has much to say about such matters despite the fact that environmentalists are calling for a major shift to GHG-free modes -- walking, biking, digitized mobility and mass transit. Will APTA participate in the 9th Podcar City conference in the Bay Area’s Silicon Valley? ATRA -- the Advanced Transit Association -- is fully involved in PCC9 and has just joined APTA. What contributions can BART make to PCC9 deliberations? The Bay Area’s metropolitan planning organization is the Metropolitan Transportation Commission. What will MTC have to say about updates to its Plan Bay Area 2040? At the northern end of the San Francisco Bay is the city of Richmond. 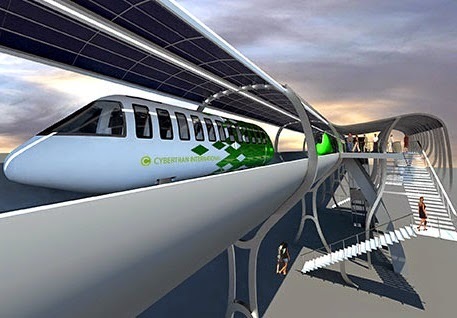 Here in collaboration with Cybertran, the municipal government is quietly advancing a breakthrough. You will learn more at PCC9 -- November 4-6 in Mountain View -- home to many Silicon Valley successes.